January is my least favorite month. You make a bunch of resolutions (or not) because you've owned up to (or denied) your flaws and weaknesses and commit to improvement. Which, you know, is a lot of hard work. And that's fine, but still. And the weather is horrid. Dreary, cold, bleak. Monday's forecasted high is -2 with the wind chill bringing the temp down between -20 and -30. The professionals call that "dangerous cold." This makes me want to say very bad words. My husband and kids have the day off and can stay in their warm toasty beds. Not me. More bad words. January is also, historically, a bad month for writing. As in, little to none. I'm still trying to right myself from the tailspin of the holidays. And this year, my husband and I are planning the Pinewood Derby for Toad's Cub Scout Pack. We have each put hours and hours and hours into this thing. I can't wait until Saturday at 2 pm when it's all over. There will be lots and lots of cocktails for Mama that night. January makes me grumpy. Not writing makes me grumpy. This year, I've also been dealing with some health issues on top of it all. Time to snap out of it. I've been trying to de-clutter and clean my house and this weekend I decided that the door to the garage in the laundry room/mudroom needed a facelift. I'd plastered it with the kids' artwork but most of it had been there for a couple of years. Time for a refresh. The kids and I spend at least ten minutes in this room in the mornings as they suit up and load up backpacks before heading out to the bus stop. I wanted to give them something to read, something colorful and interesting, some food for thought to start their days on a positive note. Ahem. I suppose it might work for me as well. This is our Door of Inspiration. 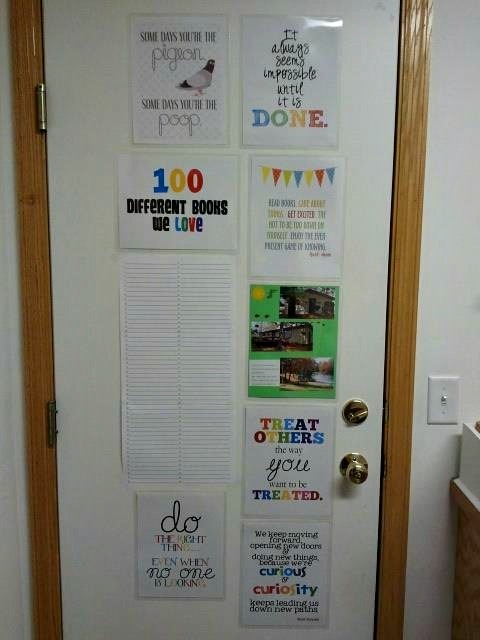 There's space for us to write down titles of 100 Different Books We Love, which I can then switch out to other fun topics, like 100 Different Things That Make Us Happy or 100 Different Foods We Love to Eat. The photos on the green paper are of the cabin we'll be staying at for a week in August with Hammer Guy's family -- something to look forward to when it's "dangerously cold" outside. Here's a photo - it's not the best quality but you get the idea. My two favorites are the sign at the top with the pigeon: Some days you're the pigeon; some days you're the poop (a commonly used word around our house) and the Walt Disney quote: We keep moving forward, opening new doors, and doing new things, because we're curious and curiosity keeps leading us down new paths. Keep moving forward. No matter how grumpy or bleak or dangerously cold life gets, keep moving forward. How are you surviving January? What quote would you include on your own Door of Inspiration? I'm with you, January weather could go away and I wouldn't miss it at all! Fortunately we don't have sub-zero temperatures here, but it's still too cold for my taste. I am looking forward to the spring. The quote I'd add would be: "The best time to plant a tree is twenty years ago. The second best time is today." I have to keep myself motivated on some of my long term projects and remember that I'll see the benefits with time. I love the door of inspiration. Awesome! The Door of Inspiration is cool! January is not my worst month. Usually it's March, when it's cold and ICY, and I'm really tired of winter dragging on. That said, it is truly COLD here in New York. 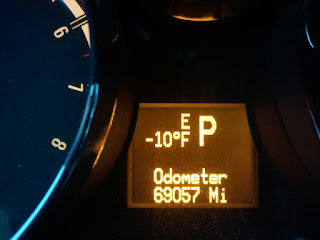 Eleven degrees this morning. Stay warm! I survive January by increasing my coffee intake. It's a hard month sometimes, for sure. I really love that door of inspiration!